Sever's Disease (Calcaneal Apophysitis) is the most common cause of heel pain in children, especially active children. Rarely if ever will a child have the other causes of heel pain including plantar fasciitis. Sever's Disease is an inflammation of the growth plate (physis) at the back of the foot where the Achilles tendon attaches. Although the name might sound pretty frightening, Sever's disease is really a common heel injury that occurs in kids. It can be painful, but is only temporary and has no long-term effects. Symptoms will ultimately resolve when the heel stops growing and the growth plate fuses. Heel Cups - Although other treatments are available, this is the most effective treatment to reduce the pull of the Achilles tendon and reposition the fat of the foot under the heel. Heel Lifts - Sometimes a heel lift will reduce the stretch of the Achilles enough to alleviate the pain. Custom Orthotics - By modifying the function of the foot and positioning the heel in the ideal position, the pain is improved. Other - Heel pads and elastic stockings may reduce the pain, but are often ineffective. 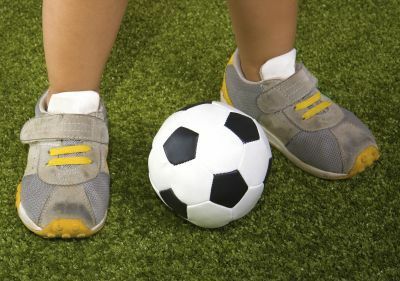 Sports - Due to the high level of activity associated with sports now, everything from soccer to gymnastics, dance to football can cause the stress to the growth plate of the heel and lead to symptoms.